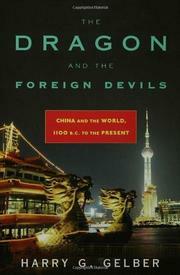 A fluent and thorough, though understandably brief, survey of Chinese history. It is a daunting task for a historian to compress the history of “a collection of tribes in the Yellow River valley” grown to “the largest state of the globe, comprising one-quarter of the human race.” Uncowed, Gelber (Nations Out of Empires, 2001, etc.) traces the rise of a discernibly Chinese state some 3,000 ago, from which emerges his overarching theme: China’s constant negotiation with, and sometimes conquest by or absorption of, a stream of foreigners, from the Hsiung-nu riders beyond the walls to the European concessionaries of Shanghai and, lately, American entrepreneurs. Other constants in his narrative are warfare; the collapse of empires presumed to stand forever, such as the Qin dynasty; and the steadily increasing centralization of power in the hands of the state, as with the tax-and-spend Tang dynasty, which required of landowners “tax in grain, tax in the form of materials like textiles, and tax in the form of labour or military service.” China has seen long periods of rule by non-Chinese; the Mongols, who succeeded the Tang, for instance, kept a careful separation of ethnic groups and conducted their affairs in the Persian language, while influential Jesuits saw to it that the language of the early modern nation was Latin. Today it is likely to be English, and Gelber concludes his able survey, studded with sidebars on such matters as concubinage and silk-making, with a quiet, Taoist-tinged note meant for those Westerners who fear China as a potential rival and enemy: “No pattern or structure of power or of relations lasts very long. America itself will change. . . . How China develops . . . equally depends on myriad decisions not yet made, or even formulated, each of them attended by the inevitability of unintended consequences.” That is to say: There’s history yet to come. Gelber makes solid work of describing China's past and suggesting what those consequences might be. A readable, sturdy overview, worthy of shelving alongside Joseph Levenson and Franz Schurmann’s China: An Interpretive History.